Central idea: Awe in God’s presence. Doctrine: Awe in God’s presence vs. the sin of presumption. Practical application: An examination of conscience on awe and presumption. To view Lectionary 75, click here. All of the earth is filled with God’s glory. The entire universe proclaims God’s glory. This means that everything that exists reflects God’s being, goodness, intellect, power, and beauty. God extends the hand of fellowship to man in directly creating each person’s rational soul. But men need to be transformed for this friendship to flourish: man must be purified of his sins and sanctified. Some men are to be instruments of this friendship between God and men. Isaiah is called to the service of proclaiming God’s message to Israel. Christ will call Peter and the apostles to this service for all humanity. This call is an invitation, not a command. When he was cleansed, Isaiah heard the invitation and volunteered. Peter will see his need to be cleansed and when Christ invites him to be a fisher of men he says yes with his feet by following him. The prophet, the apostle, and the disciple (all of us are disciples) love the Lord and serve him through worship and self-giving to his neighbor. This service includes apostolate. God’s servants and friends also rely on the Lord for help because of their weaknesses and the opposition of men. God’s servants have experience that God does support them. Not all kings of the earth have yet given thanks to the Lord, because they have not heard the words of God. A king like Herod heard the Jewish scriptures and even the Gospel through reports, yet he did not “hear” the word of God because of his countless depraved acts. So when the Word of God Himself stood before Herod, He would not speak. Herod was like the seed that fell on the path or rocky ground. The letter from which this reading is taken was written by St. Paul about the year AD 56, at most a quarter century from the event that he articulates as of first importance: Christ died for our sins and then rose from the dead. Then he lists the persons and groups who were eyewitnesses of the Resurrected Christ. This is the gospel that he and the other apostles—the fishers of men—are preaching, that they are passing down to us. Christ’s death for our sins and his resurrection for our life are the fundamental truths we assent to in our act of faith. Jesus is the Word of God who spoke the word of God to the crowds. 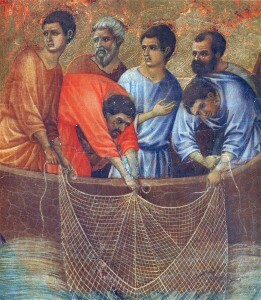 Jesus asked a favor of Peter—to let him use his boat to teach—and Peter granted it. Then Jesus bestowed on Peter the best favor a fisherman could conceive: a great catch of fish. This miracle left Peter in fearful awe, a consciousness of the greatness of Christ and his own inadequacy. Then Jesus granted Peter a much greater favor: an invitation to be his disciple. If he accepts, Peter will go from being a man who catches fish to a man who catches men. Jesus’ material gift of fish and Peter’s own material possessions suddenly mean nothing to this fisherman: he, James, and John leave everything behind to follow Christ. God brought Isaiah up to heaven to enlist his service. God came down to earth to enlist Peter, the other apostles and first disciples, and us. When Isaiah had his vision and Peter had his epiphany, each experienced deep humility, fear, respect, and reverence—in short, awe. They experienced awe, but awe can also be a habit or virtue. Blessed John Henry Newman argued that “In proportion as we believe that He is present, we shall have [these feelings]; and not to have them, is not to realize, not to believe that He is present” (quoted in CCC 2144). It is fitting for us to treat God and sacred things always with deep reverence. At first glance, awe in God’s presence seems to crush one, but in fact it leads to great daring. When Isaiah hears God’s question of whom He should send, Isaiah exclaims, “Send me!” When Christ says, Follow me and I will make you a fisher of men, Peter follows. We can do great things because God is asking them of us and he gives us the grace to actually do them. The vice in opposition to awe is presumption. So, one aspect of presumption in one’s relationship with God is choosing to sin while assuming God will forgive the sin. Another aspect is assuming God will give one grace without, say, receiving the Sacraments worthily, or without a life of prayer, or without any self-denial. Another is undertaking God’s service without being called to it and in fact without being qualified for it. It is not in our power to have an experience of awe. Indeed, fear of the Lord is one of the gifts of the Holy Spirit. However, we can ask ourselves questions in regard to awe and presumption to reveal behavior that is in our power to cultivate or root out. Here are some. Do I have a realistic understanding of what I am capable of doing? Do I endeavor to do that as well as possible? At the same time, am I open to the possibility that I might be able to do and may be called to do great things that I can hardly imagine now? Am I willing to see my own deficiencies, which my pride may try to make me hide? Do I realize that the people around me can already see these deficiencies and that God knows me through and through? Do I think I can do God or his Church some kind of favor by my actions when they are not motivated and supported by my life of prayer and the grace of the Sacraments? Would I rather do anything else besides pray? Am I happy to be distracted even when I am in my time of prayer? Do I think I can put myself in occasions of sin or actually commit sins with the assumption that God will always forgive me? Has my presumption reached such a point that I even deny I sin? Do I believe that Christ is really present in the Eucharist, both at Mass when I can receive him and reserved in the Tabernacle? In church, do I behave as one who believes Christ is present by my thoughts, participation, silence, and bodily posture? Am I daring when it comes to carrying out God’s will in my personal and professional life? Do I rely on God’s grace as I try to live as a child of God? Do I want to do great things for God and ask him to allow me to? Do I at least ask God for me to want to want to? Do I really appreciate and live Our Lord’s invitation and admonition: “Apart from me, you can do nothing” (Jn 15:5)?